← Updated Calendar, Our Newest Artist, Painting with Crayons, Lights, and More! Looking to do something NEW for your clients? Want to have a more intimate pARTy in the comfort of your own home? Looking for new events at your business? Look no further! 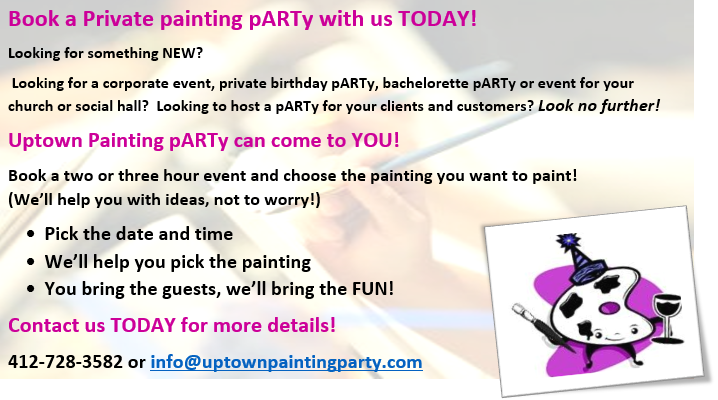 Book a Private pARTy and we’ll come to YOU! We’ll create you a flyer at no extra cost with links and QR codes to promote your event. We’ll even create your invitations! You bring the people, we’ll bring the FUN! Contact us today to book your holiday pARTy, birthday, pARTy, corporate event and more!! This entry was posted in Event Info and tagged birthday party ideas in somerset pa, events near hidden valley, events near seven springs, pa events, somerset, somerset county, things to do in somerset pa, uptown somerset. Bookmark the permalink.